Here's an event not to be missed! 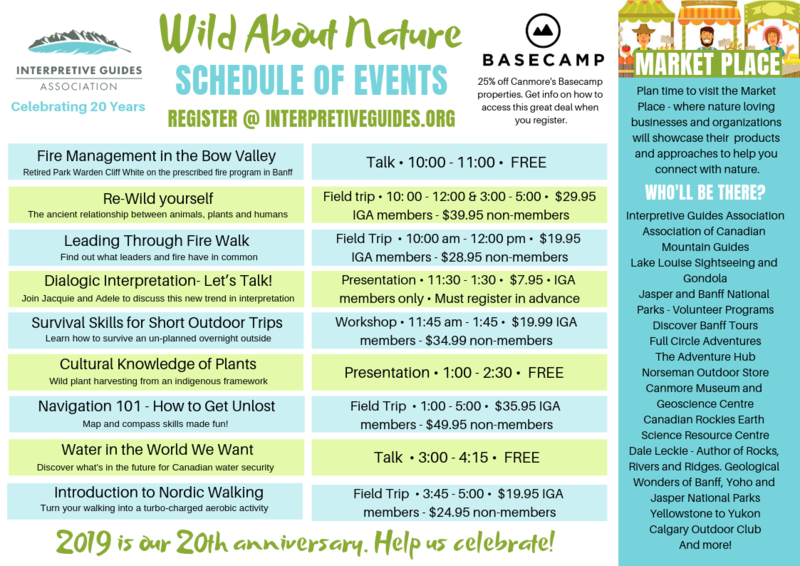 The Interpretive Guides Association present their inaugural event; Wild About Nature. If you're interested in the outdoors, in guiding, hiking, or enjoying the beautiful Rocky Mountains, you're going to want to head to the Nordic Centre on April 27! Head to the website event page: https://interpretiveguides.org/events/ for registration and more information about the different guided walks, presentations and workshops that will be available. They will also have a marketplace running from 10 - 4 pm in the Banquet room of the Nordic Centre’s main building where people can come out, meet local companies, parks staff and individuals and find out about the products and programs they offer. Cost: Some guided activities and walks have fees association with them, please visit the registration page for more details. Plus - a Marketplace showcasing local businesses, guides, guide products, parks programs and more. They will have some door prizes from some local sponsors as well as IGA clothing and interpretive props from Acorn Naturalist for sale. Head to the website now to register!